Here at CraftHub we are dedicated to helping Etsy digital shop owners! All of our features have been designed with you in mind along with feedback from some of Etsy's top selling digital shops. Our focus is on creating the best possible system for you to manage and deliver your valuable digital assets in a way that is easy for your customers to understand. Customer login pages, notification e-mails and download landing pages are all customizeable and HTML compatible. 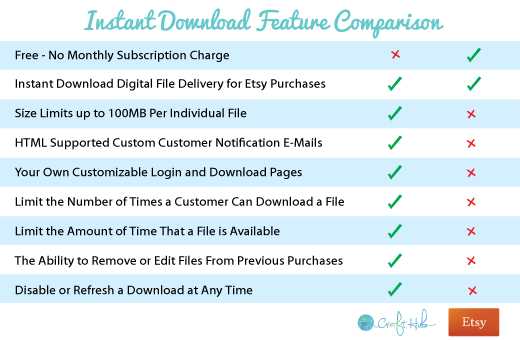 Coming soon!Soon you will be able to offer instant download file format options. Our promo tool allows you to sell bundles and offer instant download buy 1 get 1 free type specials. CraftHub accounts start at just $8/month! Subscription service automatically renews every month. You may cancel your service at any time. An online subscription software service that provides file delivery and management solutions for crafters, designers, musicians, authors, artists and small business owners. CraftHub works with the Etsy API. We are not endorsed by or associated with Etsy Inc.
Track e-mail opens, IP addresses and download attempts. Quickly and easily see who has been able to download their files. All on one page! Totally brand your customer download experience with fully custom e-mail messages, login pages and download pages. You can even us your own HTML! Set limits to the number of downloads, make an expiration date or lock access to a single IP address. You can also revise or delete your files at any time! Create bundle listings for instant download! You can also use our promotional tool to offer listing variations & Buy1Get1 type specials!